I think your a bit paranoid and need a nice lie down. "The rapid response was helped by good luck too. At the time the bombs went off, a meeting was taking place of paramedics and others involved in emergency plans and they were quickly despatched to the various sites. 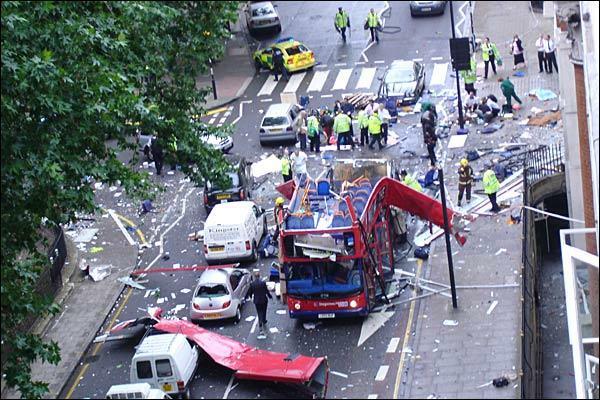 Speed is crucial in trauma cases, with the treatment in the first 15 minutes often determining life or death. There was also at the time a meeting of senior Network Rail staff in the Russell Hotel, yards from the Tavistock Square and Russell Square tube station, and, donning their emergency jackets, they were quickly able to help out at the two nearby scenes of bombings, King’s Cross and Tavistock Square." b) they were home made and not military. c) Tube trains AND BUSES are designed to have a minimum amount of flamable material. Aluminium (used to construct trains and buses)does burn, but only when exposed to prolonged intense fire. 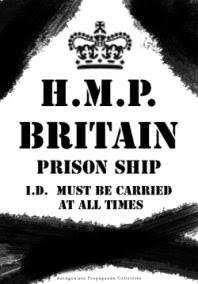 See the bombing of the Sir Galahad warship in the Falklands conflict for example of this. d) The bomb on the No.30 was detonated upstairs. Away from the fuel tank. Therefore you are wrong to compare these to car bomb attacks in the Middle East as they often use larger military explosives and incendiaries. They are detonated closer to fuel tanks on single deck buses. 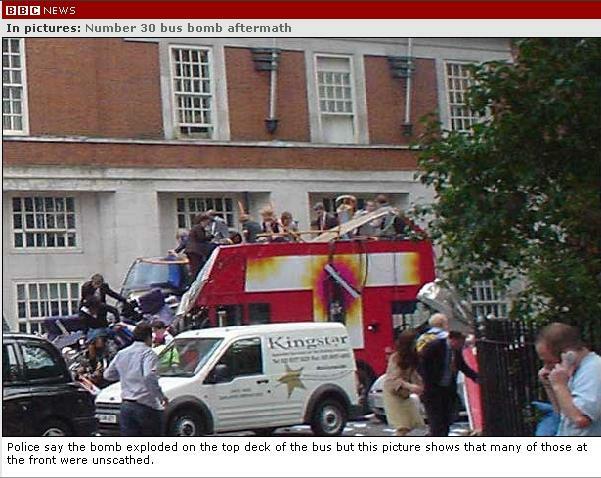 Also the bus bomb was vented by blowing the roof off, therefore less damage. Simple physics. I haven't discovered these facts in some police/press report which has eluded you. It is common sense. I would appreciate a constructive answer, aka "theory" which suggests different. Any 'theory' to explain why an alleged suicide-bomber would choose the upstairs back of a bus? Surely this position would cause the least amount of injuries? 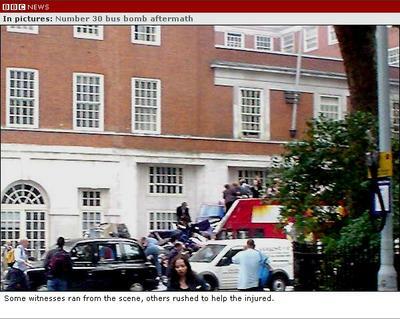 It is still beleived the bomber of the No.30 intended to bomb the Northern Line tube, but couldn't board due to delays. Therefore the No.30 was not the intended target. He had not prepared to bomb a bus. Therefore how could you expect him to consider such things as the number of potential casualties, determined by his position on the bus. He may have been simply in "transit" to another target, he had already delayed the detonation by 57 minutes and his fumblings seen by eye-witnesses suggest he was trying to delay it further. Unless you ask him I guess you will never know. I would imagine he wasn't thinking straight, as you wouldn't with a 10lb bomb on your back. 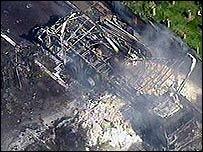 Another point, the M25 tanker explosion was industrial liquid Hydrogen Peroxide. The capacity of the lorry was 35,000 litres. Therefore how can you compare it to 4.5kg of home made Acetone Peroxide? Also, considering he was in a position which would cause "the least injuries" he managed to kill 13 people, the same as Aldgate and Edgware Road combined. Also, you might want to ask the people on the bottom deck who are not walking around unharmed, but are actually crushed and trapped under a steel floor. 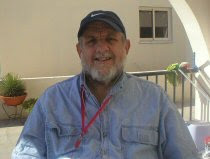 was the eyewitness Mr Richard Jones by any chance? "He said the bomber was around 6ft tall, in his mid-twenties, clean-shaven and smartly dressed. He kept reaching into the bag at his feet, thrusting his backside towards Richard's face every time. The man was wearing hipster-style fawn checked trousers, with exposed designer underwear, and a matching jersey-style top. Richard said: 'The pants looked very expensive, they were white with a red band on top. It's a strange thing to remember but he was right in my face." A description which hardly matches the CCTV image from Luton station of Hasib Hussain. It probably was Richard Jones yes, I'm not sure. I take your point. 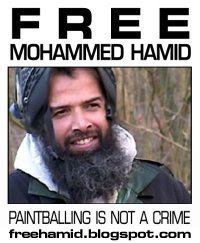 But you have merely stated a fact, so he does not match the description of Hussain, he was obviously an innocent party. 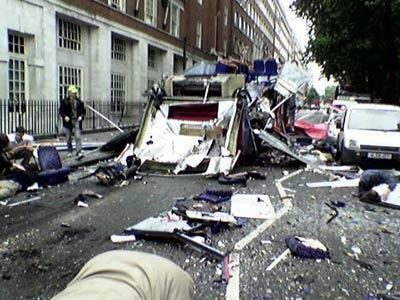 Bridget-"Any 'theory' to explain why an alleged suicide-bomber would choose the upstairs back of a bus? Surely this position would cause the least amount of injuries?" Since when does 13 fatalities and scores injured constitute the, "least amount of injuries?"? I don't know about you but in my neck of the woods I would consider that fairly horrific, in fact a complete trajedy. That is a fact you cannot argue with. Also, ever considered the fact he may have been trying to keep a "low profile" or it may have been the only available space. Maybe he had not considered that when the entire tube network is shut down and buses and taxis are the only means of public transport his "pre-booked/maximum casualty" seat on the bus was no longer available. Also, please stop spamming me with sources, make your mind up and tell me what YOU think. You are obviously twisting every report and selecting others to match a pre-conceived conspiracy theory. Stop beating around the bush and spit it out! Unless you actually analyse a source against others it is useless, you are accepting sources as fact. Isn't this the exact sort of approach you are trying to counter? You cannot pick and choose sources to present as false or lies and present others as fact, this does not stand up to my or anyone elses arguments. Especially when Antagonist tries to compare 35000 litres of liquid hydrogen peroxide with 4.5kg of solid acetone peroxide. Why should I take him seriously? The explosives were 1/8000 the size of the tanker load, a different state of matter, and not even the same chemical! NOT EVEN THE SAME CHEMICAL! How you draw these conclusions is bizarre. I find that asking questions preferable to postulating theories as I have no idea what happened that morning. What I do know is that I have yet to see evidence that is conclusive, and therefore I just keep asking questions because only the truth stands up to rigorous questioning. As for Mr Jones, I have not read any other witnesses who claimed to have seen Hasib Hussain on the number 30 bus. We have been told that the CCTV on the bus was not working, We are told that documents survived this blast that identify him. As with the trains, indestructible documents but no images in the public domain. BTW, the Northern Line was running that morning and the tube system wasn't shut down until 9.46, so why take a bus? Once again, bombs do not "destroy" things, they break them into many pieces. ID documents survived, on the bus and each train bomb! So stop going on about it. Why they had them is the REAL question. 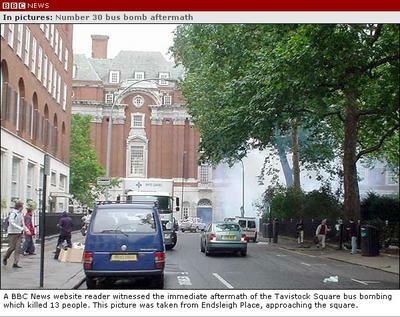 Why they had more explosives in Luton is another REAL question. I do not know the answers to those questions. Maybe you should look into that instead of claiming bombs are not bombs and suspects do not exist, and people who lost legs are "actors". Also, the northern line was delayed ALL morning. There were announcements of fires south of Waterloo all morning, which may have deterred Hussain. The underground evacuation began much sooner than 9.47, in fact at 9.25 the last of the picadilly line unbombed trains was being evacuated on the southbound platform while evacuess where exiting the northbound tunnel. I think you will find that 9.47 is the official time the evacuation was complete. And as the Picadilly line bomb was the nearest to Kings Cross the evacuation would have begun from that point on the network, exactly where Hussain would have boarded. Once more this is common sense. One more point, the explosion was very close to Kings X tube, police in the tube station heard it. When police hear a bomb explosion they KNOW it is a bomb explosion. In fact the nearest platform to the Picadilly line is Northern (ever actually been to Kings Cross?) so it would have been one of the first platforms to be evacuated. Sometime between 8.50 and 9.00. Or maybe as you suggest they allowed people to board the network, from the same station, albeit a different line up until 9.47. When apparantly a power surge had knocked the entire system out. How would that be possible? How could you have a fully operating tube network AND at the same time a power surge which knocked the entire system out? This is what you seem to be suggesting. I appreciate your knowledgable answers. Now, why have we seen no CCTV images from the stations, platforms or trains? Images have been shown for the so-called dummy run on 28/6 and the no-bombs events on 21/7 (for which there will be a court case in the very distant future), why not from 7/7? I cannot account for the lack of CCTV images, it is a true mystery and probably the only point we will ever agree on. I personally think there should be an enquiry, but into the real questions of what happened (or what didnt) leading up to July 7th. None of us have the time to argue over photos of bombed trains, which are clearly bombed, and accounts of people who were clearly maimed by bombs. It's a waste of all our time. I've been thinking about my previous point as I may have misled you. In case you're wondering who I am, I was on the Southbound Piccadilly platform at 8.35am on July 7th. I was heading to Waterloo. An announcement came over the system of "fires" or "fire drills" on the Northern Line. I can't remember where exactly, but I checked my tube map and it was south of Waterloo so I carried on regardless. Again I can't be certain but I think they were telling people to go on Piccadilly South to Piccadilly Square and back-track on Bakerloo to the other branch of Northern to carry on their journey. I would assume a similar message was announced on Northern Line platforms. Is that really what they said? Despite the shock and horror of what you've just witnessed? Sounds like tabloid speak to me, or someone who's already had their lines prepared. You are such an idiot. Shame on you!